During a visit to North Texas Friday, the state's top eduation official said he "remains optimistic" that state lawmakers will get something done on school finance reform before the end of the current session. 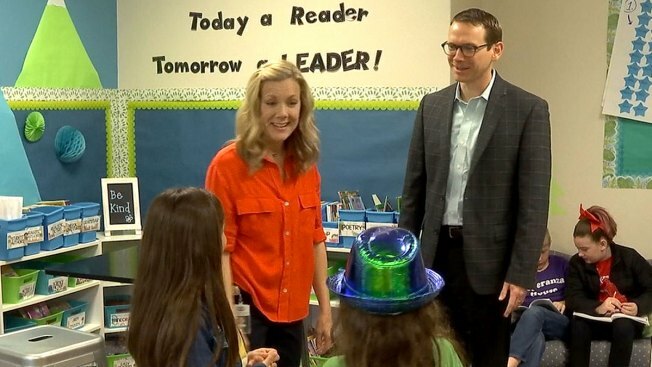 Texas Education Commissioner Mike Morath made the comments while touring Eagle Ridge Elementary in the Keller Independent School District. "The spirit is very willing and there is a high degree of alignment from our legislative leaders," said Morath. "These are thoughtful people that want the best for kids. They're just trying to come up with the best solutions." Morath was in town to meet with local superintendents and to learn more about some of the innovative programs Eagle Ridge Elementary has rolled out to keep students engaged in learning -- like their "house" model that sorts students into different teams and challenges them to earn house points. Like many school districts across Texas, Keller ISD is underfunded by the state. Their leaders have joined the chorus of eductators calling on lawmakers to pump more state dollars into the education system, which has become heavily reliant on local property tax dollars over the last decade. Among the proposals being considered by lawmakers -- upping the state's financial contributions to local school districts and giving teachers and librarians pay raises. "We want to make sure the school finance system as a whole provides the resources that all of our kids need to become the best versions of themselves," said Morath. "The proposals on the table are bold and will be of tremendous help to huge numbers of kids." The challenge lawmakers face -- and the key issue they're now debating -- figuring out where that money is going to come from and how to balance education spending with the rest of the state's budgetary needs.